A dark cloud of gas called Lupus 4 blocks out more-distant stars. Photo released Sept. 3, 2014. A dark, spider-shaped cloud of cosmic gas blocks out light from stars in a new image taken by a telescope in the Southern Hemisphere. The amazing photo, taken by a telescope at the European Southern Observatory's La Silla Observatory in Chile, is filled with stars glowing brightly in a variety of colors. Red, blue, yellow and orange stars frame the gas blob called Lupus 4, which blots out light from other, more distant stars in the center of the image. Fly through the image in a new video of the Lupus 4 space cloud from ESO. "How many stars might eventually start to shine within Lupus 4? It is hard to say, as mass estimates for Lupus 4 vary," ESO representatives said in a statement today (Sept. 3). "Two studies agree on a figure of around 250 times the mass of the sun, though another, using a different method, arrives at a figure of around 1,600 solar masses. Either way, the cloud contains ample material to give rise to plenty of bright new stars. Rather as earthly clouds make way for sunshine, so, too, shall this cosmic dark cloud eventually dissipate and give way to brilliant starlight." Another gas cloud in the same area, called Lupus 3, already hosts about 40 young stars that formed over the course of the last 3 million years, ESO said. 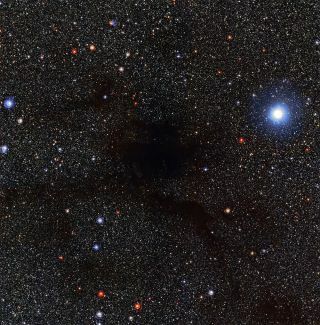 The spidery cloud is part of a loose star cluster named the Scorpius-Centaurus OB association, which is a young, widely dispersed star grouping, according to ESO. The stars in the cluster also likely come from the same huge cloud of cosmic material, representatives from the astronomy organization added. Lupus 4 — a dark, spider-shaped cloud of gas — takes center stage in this wide view of the cloud located 400 light-years from Earth. Photo released Sept. 3, 2014. These distant objects may also have lessons for nearer celestial bodies. By studying Lupus 4 and other clouds associated with the cluster, scientists might be able to learn more about how the Earth's sun formed. Astronomers think that the sun and most stars in the Milky Way started off in a star cluster similar to the one in which Lupus 4 is located, according to ESO. As Lupus 4's stars burst forth and come of age, scientists could get a sense for how stars like the sun are born in groups and then drift apart over time, ESO said. ESO is a collaboration of 15 different countries, including Brazil, Austria, Spain and the United Kingdom. The organization operates telescopes at three observing sites in the Atacama Desert of Chile.